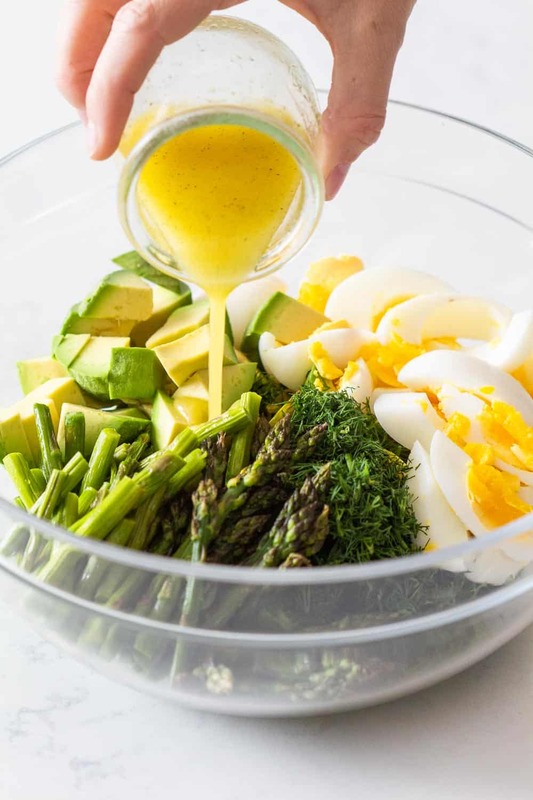 This super flavorful Avocado Egg Salad is made with super simple ingredients. 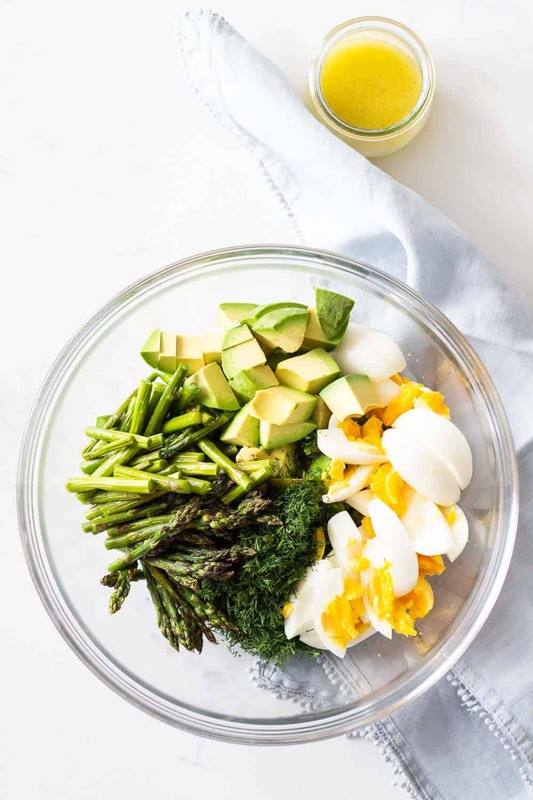 All the nutritious goodness of an avocado mixed with hard-boiled eggs, crunchy asparagus and fragrant dill. Perfect busy weeknight dinner or potluck contribution. In case you’ve missed the start of my avocado salad series, check out the most delicious Avocado Chicken Salad on the blog and also the just as delicious Avocado Tuna Salad. Avocados are probably my favorite fruit ever!! They are so versatile, super creamy and absolutely delicious. Did you also know they are super nutrient dense? They have all those healthy fats nutritionists keep talking about. “Eat healthy fats”…..but what does that even mean? Most mean avocados and nuts and seeds and salmon and stuff like that. Eat any of those and you’re good by the books of most nutritionists. No problem at all for me. I could eat avocado pretty much every single day. There is obviously a million and one recipes out there but this one is special because we’re adding asparagus, which makes it extra healthy. For me, a salad without veggies isn’t really that much of a salad. I experimented with all kinds of vegetables an lettuces and by far the most delicious combo was asparagus! 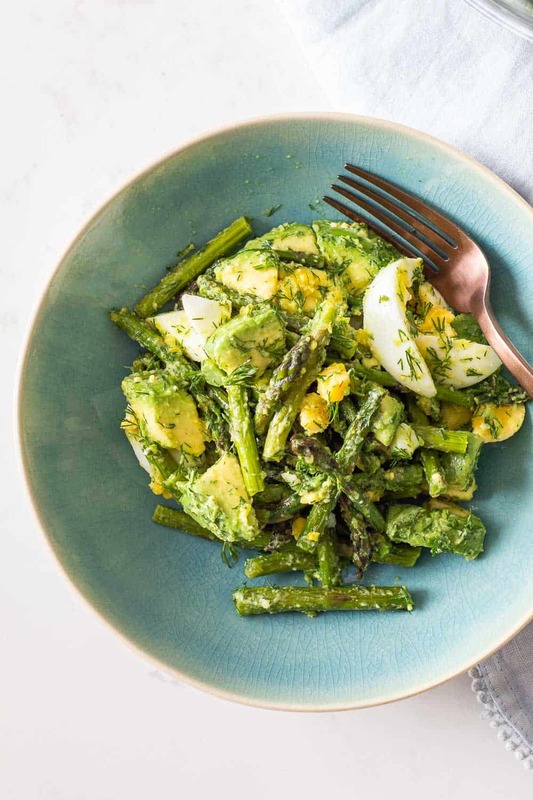 Eggs and asparagus are meant to be together. 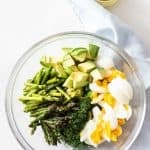 So all you have to do for this Avocado Egg Salad is boil some eggs, roast some asparagus, find a fairly ripe but not mushy avocado, cut up everything into bite sized pieces, add dill, olive oil, lemon juice, sea salt and pepper. Tadaaaaa, that’s all there is to it. How Long Does Avocado And Egg Salad Last? I’ve experimented with leaving the avocado and egg salad at room temperature for over an hour and the avocado was only starting to brown and was still totally delicious. The CDC does not recommend leaving hard-boiled eggs at room temperature for more than 2 hours. So make sure you store leftovers in the fridge as soon as possible. 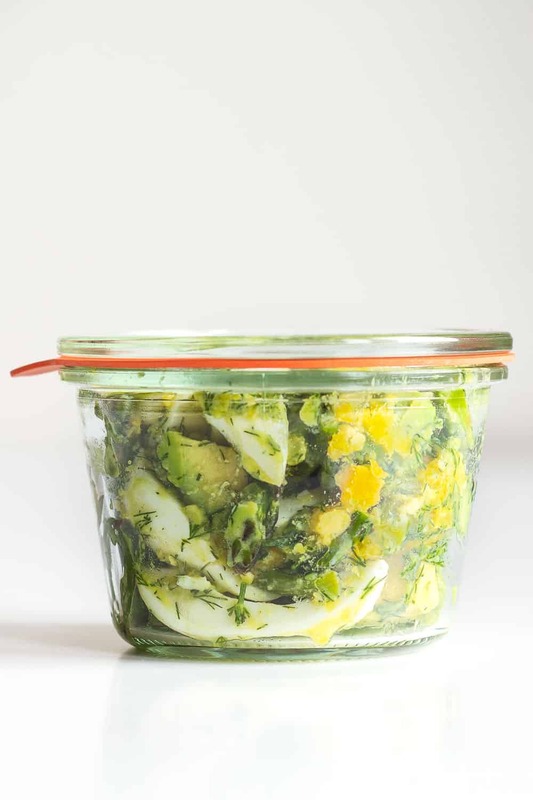 The best way to store Avocado and Egg Salad is in an air-tight container WITH the dressing smothered all over. Most salads (especially when containing lettuce) last longer when the dressing is kept separate. When it comes to cut up avocado it’s better to store with dressing all over though. The acid from lemons or vinegar keep the avocado from browning. In the fridge this salad will be fine for about a day. Does Egg Salad with Avocado Turn Brown? YES! Unfortunately. No matter how well and fast you store your egg salad with avocado, it will definitely brown. Now, the faster you store it in an air-tight container and in the fridge, the slower the process will be. I find that if I store avocado in acidic dressing it’s still pretty good 24 hours later. It’s also important to note that if avocado browns a little it’s not the end of the world and definitely no reason to through out your entire salad. It still tastes great. It’s not until it’s completely brown and mushy that it gets gross to eat. That usually doesn’t happen until day 2 after preparing. Preheat oven to 400F and bring water to the boil in a small pot. Trim dry ends of asparagus, add to a baking sheet in one layer and drizzle with a little bit of avocado oil and sprinkle with sea salt. Massage in oil and salt and then roast for 5-10 minutes depending on thickness. Carefully add fridge cold eggs to boiling water and cook for 8 minutes. In the meantime, half, pit, peel and cube avocado and add to a large mixing bowl. Wash, dry and chop dill and add to avocado. Cut up roasted asparagus into bite size pieces and add to other ingredients. Peel and cut eggs into wedges and add to mixing bowl. In a small sealable container shake together juice of whole lemon, olive oil, sea salt and pepper, then drizzle over salad and toss well. Serve immediately or store in an airtight container in the fridge for up to 12 hours. I made this with fresh basil instead of dill. Delicious! I made this recipe but I subbed in balsamic roasted brussel sprouts because I didn’t have asparagus. Also incredible and would definitely make again!!! Uuuu, that sounds amazing! Will have to try with Brussels sprouts next time. Is there a way to make this keto friendly? It already is very keto friendly but if you want to reduce the carbs even further you have to play with the amount of asparagus. Do you cool the eggs and asparagus, or serve while they are still warm? I serve while still warm but tastes great either way. Looks yummy. Is there an alternative to dill that you would suggest? I am on the keno diet and would like to have zero or 1 sugar. 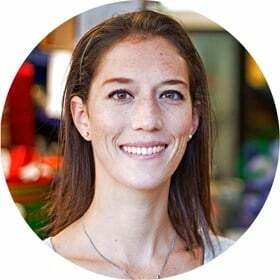 How can I reduce the sugar content? You would have to leave out all asparagus. Then you’d end up with 2g sugar. That said, one suggestion regarding the avocado browning…when I eat only 1/2 of one, I put the pit back with the avocado. It will keep the other half from browning. Perhaps that will work if one needs to store it for a second day???? just a thought! This sounds amazing, I cannot wait to try it, and now I am totally curious as to what other recipes you have that I HAVE to know about! Yes! This AND storing in an airtight way are the most effective. Oxygen makes the flesh brown. So once you cut into it store it in an airtight container and in the fridge asap. I just made this for lunch, and it was delicious! Will definitely be trying more of your recipes as we are trying to eat healthier. Thanks! Great recipe the only modification I made is that I added grape tomatoes halves and turned out awesome, and it popped with color. I made this salad and really love it! I thought it would be ideal for a keto diet. Can you tell me the difference between total carbs and net carbs? Leslie, I’m happy you liked it, to calculate net carbs you have to subtract fiber from total carbs. So, in this case, you’d have 23g-13g=10g net carbs. Absolutely Keto friendly. To reduce the carbs because you need less, you would have to reduce the amount of asparagus. Anyone know the weight watchers points? I saw this salad and immediately fell in love just by the ingredients. Reading comments by adding spinach took it to another level. I can’t wait to make it. I can taste it already. May I ask where you bought those glasses that you used to prepare the dresssing in? They are awesome! They are from the brand “Weck”. I first confused them for some glasses I have from a company that sells sour cream in them but then I rewatched the video and saw I used my Weck glasses. Perfect salad recipe. I love both and the combination is perfect! Is the calorie for the entire salad? No, for 1 serving. I state in the recipe card that it’s for 2 people so the whole salad is 2 servings. For the whole salad you would have to double all the nutritional information. How do you “massage” oil and salt into asparagus? I have never used avocado oil, so forgive my ignorance. It is possible to use avo oil instead of evoo in the dressing? I love evoo, but avo oil sounds delish! Evoo isn’t the best oil for roasting because its smoke point is pretty low and burns in the oven at 400F. Avocado oil as a much higher smoke point and is fairly tasteless so it’s great for roasting anything. Any tasteless oil with high smoke-point will work though. I love it the way it is and I’ve also added cucumber, chives and a table mayo just to have a variety when I make it…the recipe way or another way! Thank you for a great recipe! 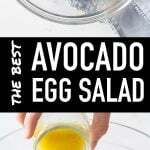 I love avocado and boiled eggs, and this recipe perfectly combines them. My one question is – how is one serving measured? It doesn’t say that in the nutritional information provided. Thank you for sharing this recipe! The whole recipe is for two people so one serving is half the salad. This is too high in fat to be on a page for healthy cooking. I am Foods and Nutrition Educator and this salad is beautiful. It contains healthy fats…please note..Fat is not the enemy, nor are Carbohydrates. One needs a healthy balance. This salad has wonderful nutritional qualities. A healthy diet is one in which you have balance throughout the day and week. I love how straight forward this is! I’ll probably just add spinach or a little extra greens to this!